Did you know garage doors can account for almost 40% of your home’s facade? That’s a pretty large percentage, right! That means with just new garage doors alone, you can dramatically change the look and feel of your home. Well, I can’t wait to show you what we did! We’re finally getting into the fun part of this outdoor project. I’m going to show you how we switched out the old garage doors for our new and improved GARAGA doors. 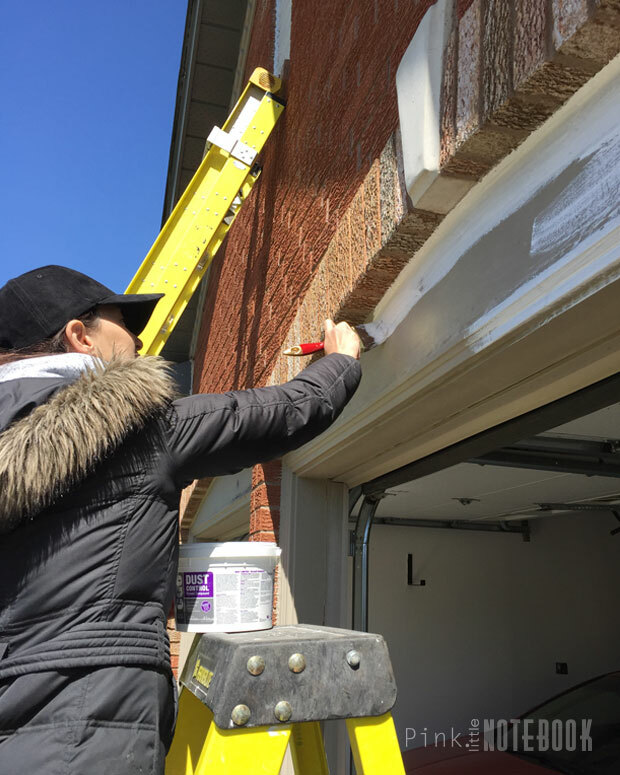 Let’s begin with the garage door trim (also known as the jambs). It’s quite common to see the jambs rotting at the bottom of the frame over time. You can see from the picture below, that our trim has started to crack and split which means water has begun to penetrate behind the paint. There were a couple of options I could have done. 1) replace all the wood, which is the most expensive route to go; 2) I could use aluminum capping over the existing wood, which is a mid range expense; or 3) repair it and paint it myself, which of course, barely costs anything. Being a DIYer, I chose to fix it myself. Since I didn’t have any damage or rot beyond repair, I knew I could salvage the wood and prolong the life just with a new paint job. All I did was give the frame a really good sanding to wear down all the old paint. Use a wood filler to fill in the cracks. Prime the wood with a high quality exterior primer (PARA Paints, Exterior Primer, 750) and finished it off with exterior paint (PARA Paints, JoJo Whitewash,PF17) which was tinted to match our white window frames. And voila, it looks brand new again. . .
Next came the garage doors. I discovered not all garage doors are made the same way. In fact, there’s so much to consider when choosing garage doors for your home. Things such as durability, ease of maintenance, insulation, style and so much more. I will say this though. It’s not until I actually did all the research on “what makes a quality garage door”, that I realized the smartest choice anyone could do in the first place is just choose a reputable garage door manufacturer. A great brand takes out all the guess work for you. 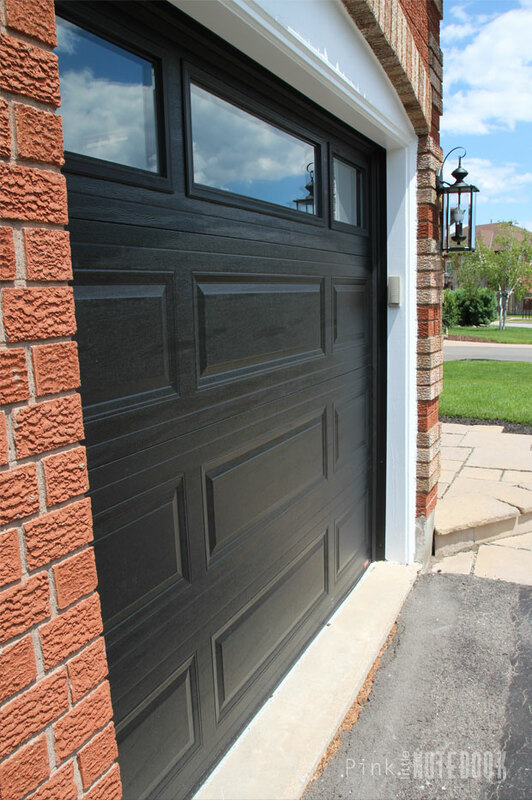 They know how to create durable, long lasting garage doors and when it’s backed by a great warranty—you know they truly stand behind their products. That’s why we’re proud to team up with GARAGA. They are a leading Canadian garage door manufacturer with distribution spanning across Canada, the United States, Central & South America and the Middle East. What I found most impressive about this company is that all their residential products are actually commercial grade standard. They are built to withstand years of use. For our home, we picked out two 8′ x 7′ black Standard+, Classic Mix garage doors with thermopane windows. I chose this colour and style because I wanted our curb appeal to somewhat reflect the contemporary interior feel of our home. I also wanted to drastically change our curb appeal. 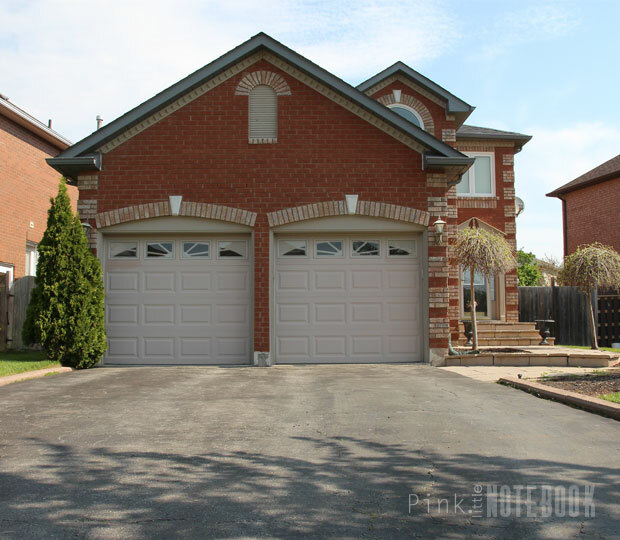 Although, the black garage is a deep contrast against our red brick, I will show you in upcoming posts how I will pull together a cohesive look. My new doors have very unique features to them which make them one of most solid, and energy efficient doors on the market. 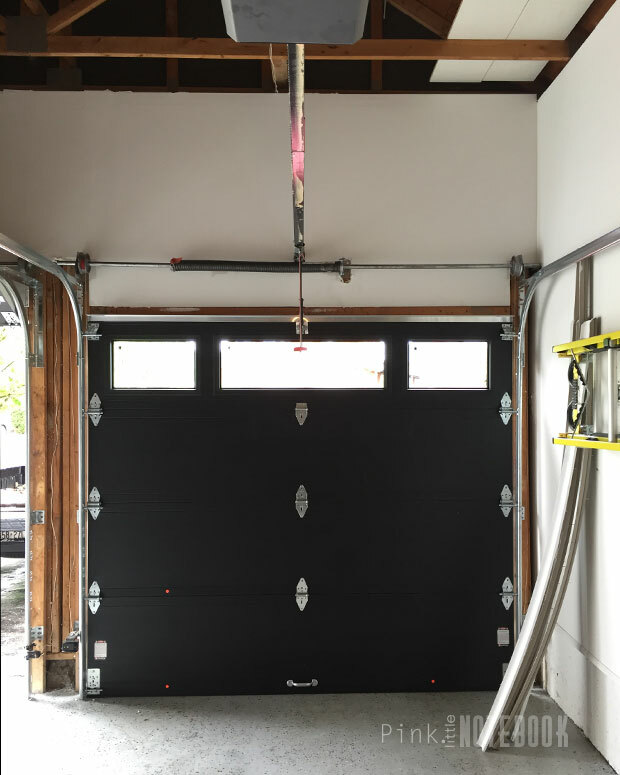 I’ve made a few notes along the way worth mentioning to help you whether you’re currently shopping for new garage doors or thinking about it in the near future. Although we are huge DIYer, we also know when it’s time to call in the pros. Winding the springs requires special tools and could be fairly dangerous, if you don’t know what you’re doing. We hired help for this one. Polyurethane insulation and nylon rollers are the way to go (both standard features on GARAGA doors). The higher the R value, the higher the insulation and protection. Keep in mind, not all R values are created equally. You also want to pay special attention to the construction of your door panels. A well-made door means zero heat loss! Garage doors get a lot of use. Standard torsion springs are usually 10,000 cycles, which can have short lifespan. 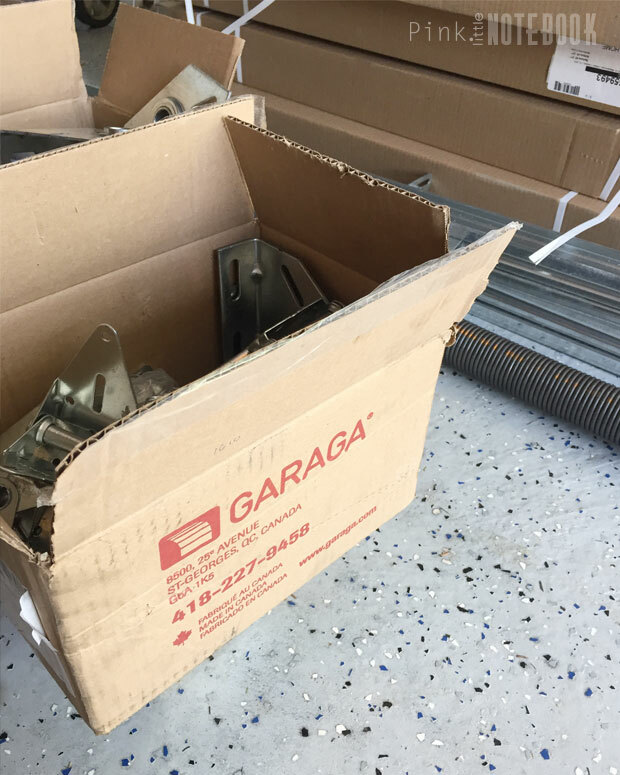 GARAGA doors come with a torsion spring of 20,000 cycles, that’s at least 28 years of normal residential performance. 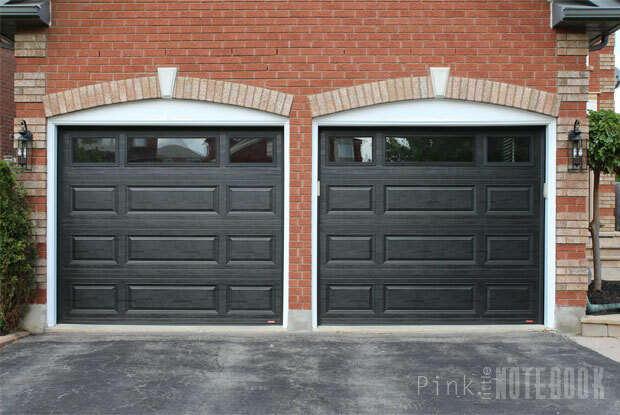 Steel garage doors are a great choice for homeowners. It’s sturdier than aluminum doors and it’s not as high maintenance as wood doors. There’s not much you need to do besides clean them down every once in a while. 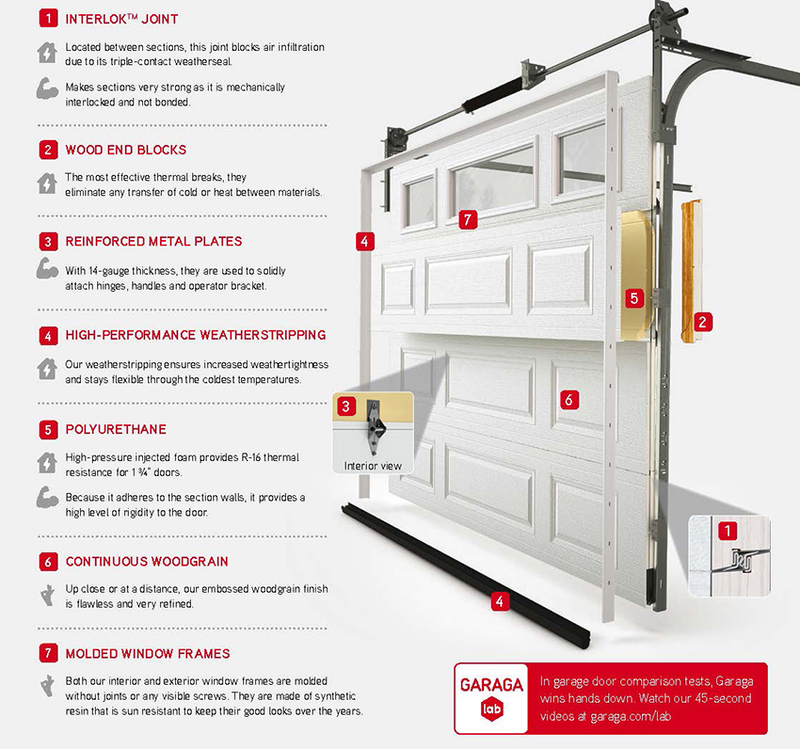 If your garage doors are in need of some help, you have exactly SIX more days to enter GARAGA’s amazing giveaway. Win the garage door of your dreams plus all the accessories for smart technology. No purchase necessary. *Click through these links to see more about our exterior makeover: Updating our Curb Appeal, How to Repair your Crumbling Concrete Wall, Fixing a Walkway with Sinking Stones, Reviving our Exterior Front Entrance, Exterior Update, How to Renew your dated Driveway & Curbs, Five Ways to Upgrade your Front Door, Exterior Makeover: Before & After. 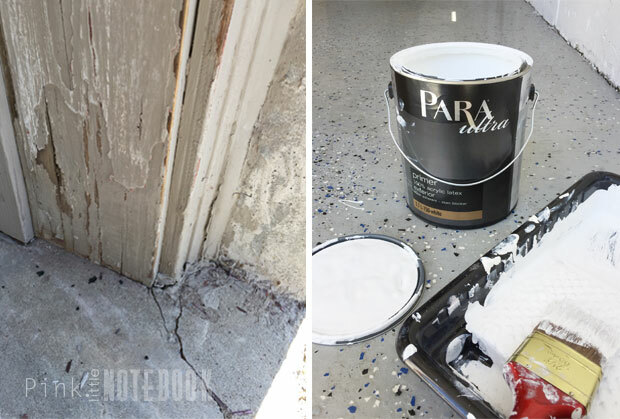 Disclosure: Thank you to GARAGA Inc. and PARA Paints for partnering up with me in my outdoor makeover. As always, this post reflects my honest thoughts and opinions. Your garage doors look amazing! We just bought a house and it has double garage doors too! Wow! What a transformation!! I love your new doors! Thanks so much Ashley! I can’t wait for it to come all together! Thanks Kathiey. Black has such an elegant feel to it!! Ah! Love. This is a beautiful transformation and I love your new doors. Thanks Helen! It’s so nice to have our new doors in! The garage doors look fabulous. They even look great from the inside! Can’t wait to see how you pull all the other exterior elements together. Thank you Jen! 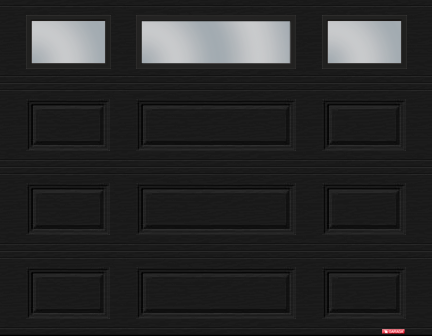 They are such great garage doors, I can’t wait to share it all! I LOVE the after! You did a great job, and they compliment the brick SO well! I love your new and improve garage, it’s beautiful . However, I have a question. We are in need of a new “high performance weatherstrip”. Where did you purschard yours? Hi Ivory, if you’re looking to purchase GARAGA garage doors, the high performance weatherstrip is a standard feature that comes with the doors. 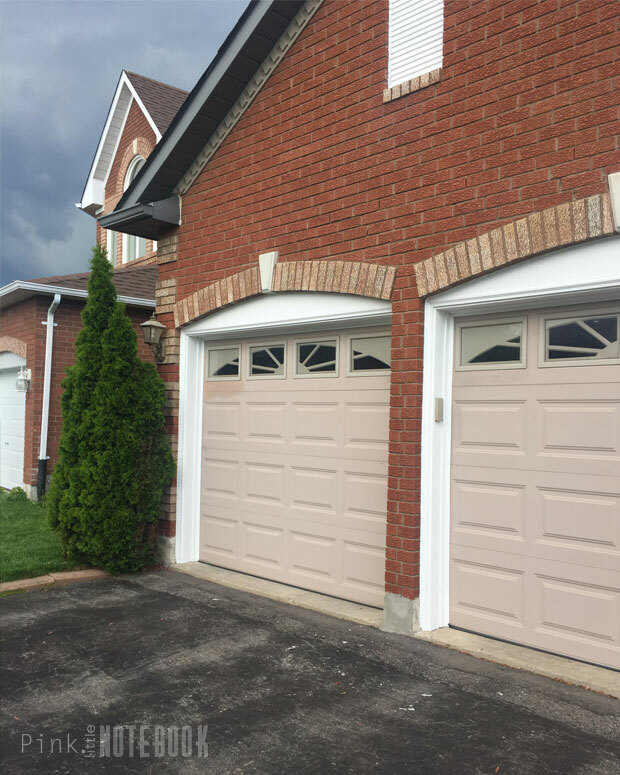 If you’re just looking to add weatherstripping to your existing garage doors, I would check out a GARAGA dealer (http://www.garaga.com/ca/find-a-garaga-dealer/) in your neighbourhood, they maybe able to help you with the purchase of weatherstripping. All the best!